Andalusia is the southernmost part of Spain. Although economically the poorest region in Spain, it is arguably the richer in culture and cultural identity. Bullfighting, flamenco, and Moorish-influenced architectural styles, to name a few, are all of Andalusian origin. It is also the home of Spain’s Gypsies. This stew, called Olla Gitana, is a favorite among the Andalusian Gypsies. The use of almonds and bread crumbs is of Moorish influence (early Muslims who once ruled Spain), while the inclusion of pear is a distinctly Gypsy touch. 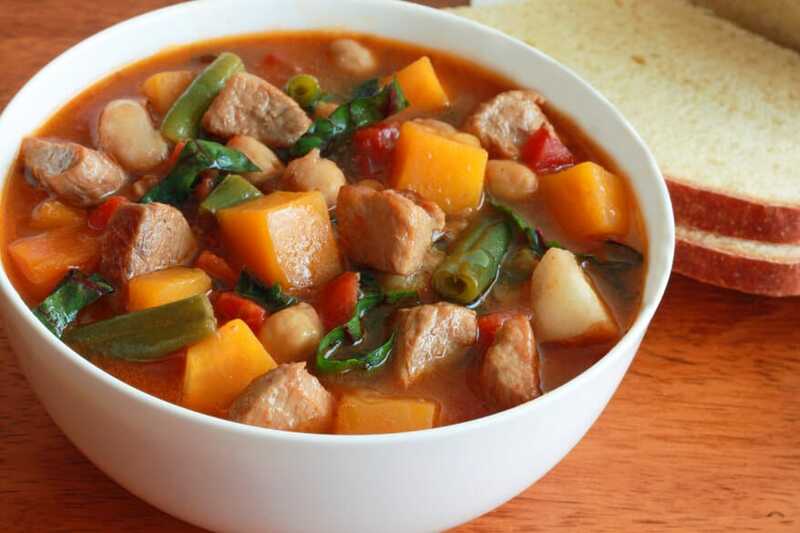 A hearty stew of garbanzo beans, pork, sausage, green beans, pumpkin, pears, Swiss chard, almonds, onions, tomatoes and spices – a full array of ingredients and interesting flavor combinations that will leave you feeling satisfied. You may even feel inspired to reach across the dinner table, grab your partner, and dance the flamenco! Note: Levante, a neighboring area of Spain, also commonly eats a vegetarian version of this stew. Simply omit the meat and increase the amount of pumpkin by a cup along with an extra pear. Saute the onions and garlic and follow the instructions from there, skipping the hour of simmering. 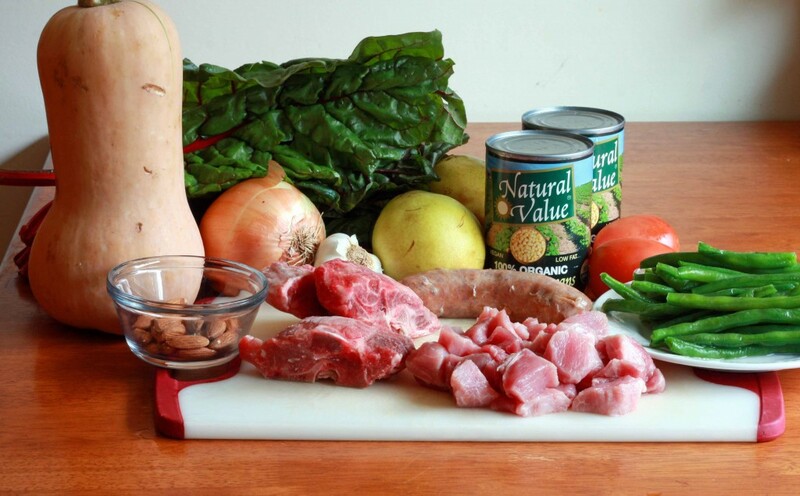 Below are just a few of the ingredients that are in this wonderful gypsy stew. So many healthy, delicious ingredients and flavors. 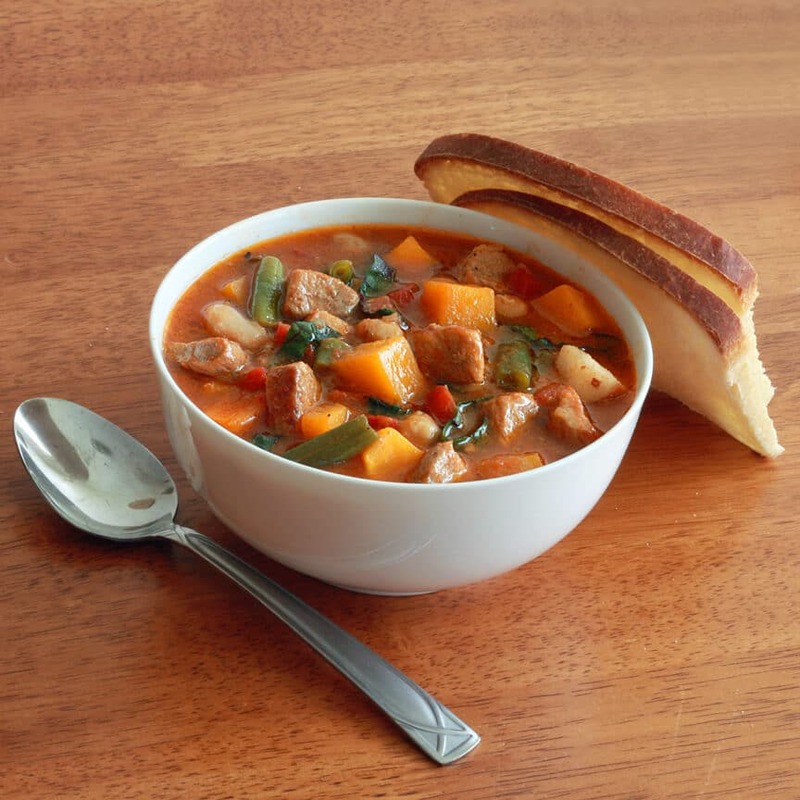 You’re going to really enjoy this gypsy stew recipe. Heat the olive oil in a Dutch oven on medium-high heat. Pat the pork cubes with paper towels to dry (this will enable browning). Fry the cubes of pork on all sides until nicely browned. Remove and set aside. Fry bones until the meat on them is browned. Remove and set aside. Fry the ground sausage until no longer pink. Add the onions and saute until translucent. Add the garlic and saute for another minute. Return the pork and pork bones to the Dutch oven and fill with water just until the meat is barely covered. Add the bouillon cubes and paprika. Bring to a boil, reduce heat to low, cover, and simmer for one hour. Add the pumpkin, beans, tomatoes, almonds, bread crumbs, and red wine vinegar. Return to a boil, reduce the heat to low, cover and simmer for another 20 minutes. Add the Swiss chard and pears and continue to simmer for 10-15 minutes. Add salt to taste. Thank you for your kinds words, Maria. Yes, you’ll enjoy this stew! It’s fully of yummy, healthy vegetables and is even better as leftovers. I made it for lunch today and it was even better this evening as the flavors have had time to blend. Maybe to aroma of this stew will help coax that baby out!! Best wishes to you and the soon-to-arrive little one! At what point do you add the vinegar? Hi Becky! Thanks for catching that – it’s added in the first part of step 3. Congratulations for your wonderful web. I love it. I am from Madrid (Spain) and I your gipsy stew is fantastic. Thanks so much for visiting and for the compliment, Mayte, and friendly greetings to beautiful Madrid! What cut of pork do you use?